A gigantic sustainable tourism project is taking shape in the city of Al Ain by order of the government in Abu Dhabi – a 400-hectar wildlife park and resort with hotels, themed safaris, residential areas and the associated infrastructure. The first building to go up as part of the master plan was the Sheikh Zayed Desert Learning Center, planned as a museum and research centre for desert environments and ecological issues. Pioneering state-of-the-art architecture and technology, this building (total investment cost 56 million EUR) proves that sustainable building concepts can be implemented in desert locations, too. The aim was to reduce environmental impact and life-cycle costs significantly with the aid of innovative designs and technologies. 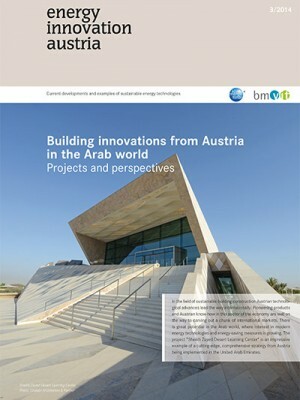 The project was designed by the Vienna architects Chalabi Architekten & Partner, acting as lead consultant, in a comprehensive process, and implemented largely with Austrian contractors (STRABAG AG, S.O.L.I.D. GmbH, ertex solar GmbH, Bartenbach GmbH, iC consulenten ZT GmbH, Bollinger, Grohmann & Schneider ZT GmbH) and in collaboration with scientific partners (AIT Austrian Institute of Technology). The starting-point for the architectural approach was the idea that the building ought to grow out of the landscape and adapt to its harsh, rugged surroundings in terms of design. The architects planned a walk-in sculpture in the shape of a three-dimensional spiral, the highest point of which towers almost 20 metres above the desert landscape. Covering roughly 14,000 m2, the structure is grouped around an enclosed courtyard, and leads up to an elevated vantage zone that offers a fine view of the Wildlife Park and the rugged ridges of Jebel Hafeet, one of the highest mountains in the United Arab Emirates. Construction involved mainly local materials; for instance, the entire building shell is clad with natural sandstone from neighbouring Oman. The lozenge structure of the façade results from the stone receiving differing surface treatment, to create smooth and rough surfaces. A key issue in hot climates is how to cool buildings; as a rule this consumes a great deal of energy. 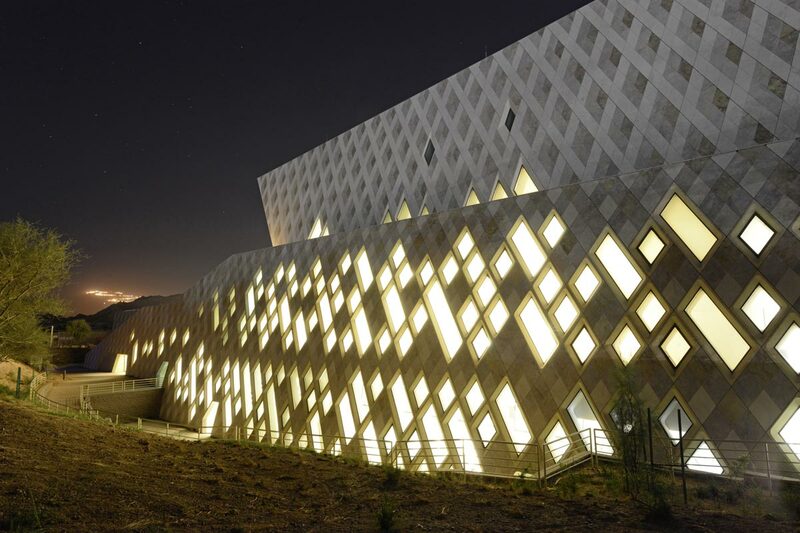 The Desert Learning Center reveals how the architectural design can help to keep down energy consumption for cooling. The building lies partially submerged into the ground to some extent – one-third of its cubic content lies below ground level. The entrance area faces north. A low heat transfer coefficient, coupled with the considerable thermal mass of the outer shell (made up of massive concrete walls with an insulated sandstone façade plus air gap behind) greatly reduces the amount of energy needed to cool the building. A roofed enclosed courtyard and a shaded outside court also help to benefit the building‘s climate. 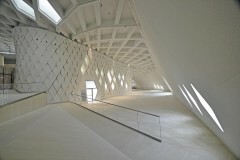 The deep window recesses and roof overhangs above the large glass façades minimize the amount of direct sunlight entering. But enough daylight is still emitted into the building to illuminate the interior efficiently, in conjunction with the building‘s pioneering approach to lighting. The Sheikh Zayed Desert Learning Center is largely self-sufficient in energy; with the aid of the sun‘s warmth, earth coupling and photovoltaics it can cover 80 % of base load using renewable sources of energy, almost the whole time. Combining active and passive use of solar energy, and employing systems which conserve water and energy, has enabled the building to meet the most stringent criteria of sustainability. The building has been certified in the US program LEED™ (Leadership in Energy and Environmental Design) with the LEED™ Platinum Standard, and was the first building in the Emirates to be awarded the Arabian Green Building seal of approval: 5 ESTIDAMA pearls. Column free and without a single right angle – the complex geometry was worked out in advance by the architects, and then co-ordinated with the structural engineers, Bollinger, Grohmann & Schneider.